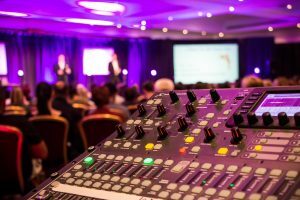 Code Audio Visual are again the AV supplier of choice for the Fully Booked Formula. Having worked together for almost 3 years, Code continues to supply great audio visual support with excellent value for money. 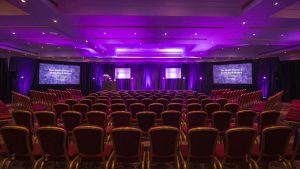 This year, the conference has moved back to the Double Tree By Hilton Hotel in Coventry and they wanted something a little different with the AV, but still keeping a similar look and feel. Instead of the usual truss rigging, Code used a pipe and drape system for the black backdrop and the 10′ widescreen projection screens. All the lighting was floor mounted, with the moving lights mounted on 1.5m poles. As usual all projection was in Full HD, being run from 3 MacBook Pros through a HD vision mixer. In total there are 8 computers at front of house running the show! We will be back with Fully Booked later this year for 2 more events.